Our family just returned from a much-needed family trip to Disneyworld. It was wonderful to be together – just the 5 of us. Well, just the 5 of us and 1,000s of other people who thought it would be a great idea to visit central Florida in October. Our trip began with the ultimate surprise. We had been mentally preparing the children for the day long van trip for months. We were able to snag some decent airline tickets, so we took the 3 children on their first airplane ride! When we were seated, I was assigned an aisle seat about 7 rows back from the rest of the family. Wyatt (almost 2 years old) rode in my lap for the whole flight. Well, he was supposed to anyhow. There was another passenger in the window seat on our row, and he looked like he hoped to sleep the whole flight. Wyatt wasn’t having that. 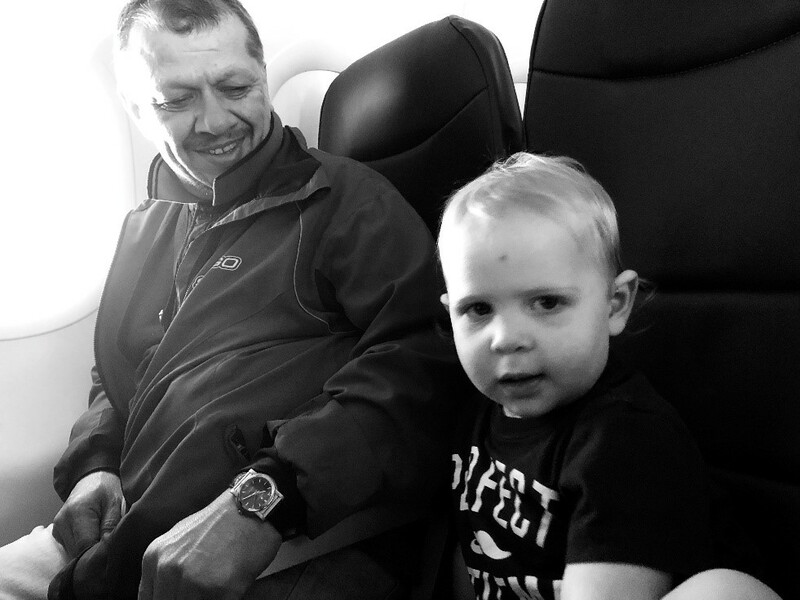 Shortly after take-off, our busy and friendly little guy crawled across the empty middle seat, put his hand up and exclaimed happily “High five!” to the poor soul with his head in his hands. His eyes were closed. Oh no. I could feel the tension growing within me, and my anxiety began to peak. This could have gone badly, and we were stuck this way for another hour and ten minutes. Thankfully, the man lifted his head, gave us a huge grin, and gave Wyatt a high 5. Wyatt continued with his usual flow of baby tricks by offering him a “fist bump” as well. Our new friend obliged, and never put his head back down for the rest of the flight. We learned that his name is Fairuz, and he is from Pakistan. It was his first trip to the US, and he was doing a country-wide tour with lots of visits planned with friends and family members. As Fairuz and I were getting to know one another, Wyatt was in and out of both of our laps playing with us. He took time to look out the window with Fairuz as he showed him the wing of the airplane and the clouds below. As Fairuz and I let down our guard and established a friendship, I couldn’t help but think about what this relationship would have looked like 10 or 15 years ago. Would I have been so comfortable to allow my baby to play with a Pakistani man on an airplane? Would I have asked to switch seats out of fear? Would I have completely missed out on this grace-filled friendship because of prejudice and ignorance? Fairuz and I were better together on that flight. He encouraged Wyatt to eat his snacks so he wouldn’t become fussy. He allowed him to look out the window and explore below the seat. He helped him into the seat and buckled and un buckled his seat belt for him repeatedly as a part of Wyatt’s game. He even caught him from falling to the floor when we hit unexpected turbulence. He loved Wyatt, and Wyatt loved him. I asked to take a picture of the two of them near the end of our flight to remember these moments. He quickly agreed, so I’ve included it with this post (click here). As we exited the plane, we said goodbye to Fairuz and wished him well on his travels. Wyatt hugged him, gave him a high five, a fist bump, and then blew him kisses. Fairuz returned every gesture. It pays to be open to strangers. You never know when you’ll be surprised by kindness and generosity. You never know what lessons God will teach you. Sometimes the lesson is to let others in, to allow them to help you and enrich your life. My heart is full, thanks be to God!